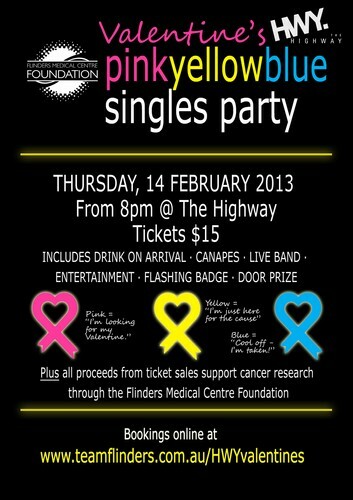 Head to the Highway this Valentine's Day from 8pm for the Flinders Medical Centre Foundation's pinkyellowblue singles party. 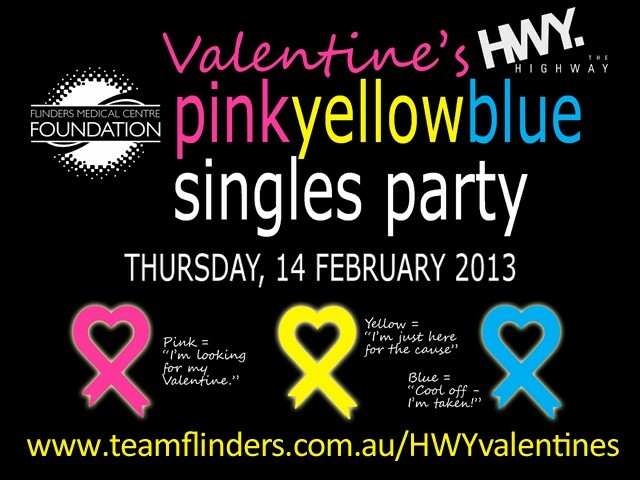 Tickets are $15 and must be pre-booked at www.teamflinders.com.au/HWYvalentines, there will be limited tickets available at the door. Price includes drink on arrival, canapés, live band & entertainment, door prize and a flashing badge in your choice of colour. There is also a special earlybird door prize for those who book before 7th February. Single and looking to mingle? A pink pin is just your ticket to a fun night. Who knows, you may just find your Valentine! If you don't want to give too much away you can be more ambiguous and wear yellow. Let everyone know you're (mostly) just there for the cause! Already loved up? Then the blue pin's for you! Bring your sweetheart and enjoy the live music, canapés and drink specials. Whichever colour you choose to wear, all proceeds from the sale of tickets and money raised on the night will support vital cancer research at Flinders Medical Centre.